Totem Sky review | What Hi-Fi? 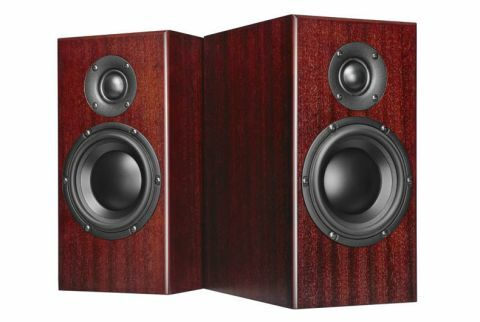 Ask us to name our favourite premium standmounters, and we’d have no hesitation in recommending ATC SCM-19s (£2150) and PMC’s Twenty5 22 (£2450). Both are exceptional performers with talents broad enough to worry far pricier alternatives. It’s a measure of how much we like Totem’s Skys that we feel they should now be added to that short and rather exclusive list. The Skys are easy speakers to underestimate; at a casual glance they just look so ordinary. As is Totem’s way there’s little that’s overtly glamorous here, but look carefully and there’s plenty to suggest the company has an obsessive way with engineering. Those compact, 31cm tall cabinets – available in white, black and the mahogany of our review sample – may look plain by the standards of the price, but they’re immensely rigid thanks to mitred joints. Give them a tap and they make a short sharp crack rather than a dull thud, suggesting any unwanted energy is dissipated quickly. Take a look inside and you’ll find the panels lined with borosilicate damping to provide resonance control without deadening the sound too much. These are two-way speakers with a small, rear-firing port, nothing unusual there. Investigate further and you’ll find the long-throw 12.5cm mid/bass driver sports a large (76mm) voice coil, which helps power handling – the company claims a peak power rating of a highly impressive 500W. This mid/bass unit is integrated with an unusually large 33mm dome tweeter using a first order, hard-wired crossover network. Totem believes the simplicity of such an electronic network helps with resolution and transparency. Considering the innately demanding nature of any speaker that sells at this kind of price the Skys are pretty easy to accommodate. They sound best when placed close to a rear wall. The company suggests a range of 15-90cm from the rear wall for the best balance. In our test room, we ended up with them slap bang in the middle of that. This position gave us good bass authority without compromising their stereo imaging abilities. As with most speakers, room corners are a definite no-no. You’ll need solid stands too. Something rigid and not overly heavy works well. We got fine results with Custom Design FS104 Signatures stands. The Skys are transparent enough to show up any flaws in the electronics featured upstream. Use something that has plenty of poke that you like the sound of, and you won’t go far wrong. A word of warning, though. They’re also a little unforgiving. If your kit has a tendency to aggression these speakers won’t respond well. Their treble output isn’t smoothed or rounded in the way of many rivals, so you’ll certainly hear any shortcomings in this area. But these are premium priced speakers, so it’s not unusual that careful system matching is needed. Get it right and you’ll one of the most enjoyable performers we’ve heard at this level. The Sky’s sound is lively, entertaining, but most of all, fun. We start off with The Dead Weather’s 60 Feet Tall and these standmounters sound right at home. They capture the feel of the song brilliantly, delivering all the drive and atmospheric tension well. The Totems aren’t massive, so really deep bass isn’t on the menu, but their bass output is taut, punchy and surprisingly authoritative. There’s plenty of punch and attack here, as well as an ability to reveal plenty of detail and organise it in a coherent and stable manner. We move to Nick Cave’s People Ain’t No Good and enjoy the Totem’s explicit midrange and their ability to deliver Cave’s gritty voice with all the finesse and bite it deserves. These speakers are great at communicating the changing momentum of a song, and given a rhythm track are happy to squeeze every drop of musical value from it. The result is a sound that has emotional impact and one that keeps you listening for hours on end. Switching to Orff’s Carmina Burana shows the Totem’s impressive dynamic abilities. They really don’t hold back, rendering crescendos with enthusiasm and an impressively scaled soundstage. Shortcomings? They’re not the most even of speakers when it comes to tonality, but fortunately don’t err so far as to distract us from enjoying the music. Equally, it’s not hard to find more refinement at this level, but, once again, they avoid taking it too far. The Totems aren’t perfect. We’ve yet to find any piece of hi-fi that is. But they are a hugely enjoyable listen, focusing their talents on delivering one of the most musically convincing presentations we’ve heard anywhere near this price. Highly recommended.